In general, when selecting a power supply, it is important to choose one with appropriate voltage and current rating to support the system requirements. 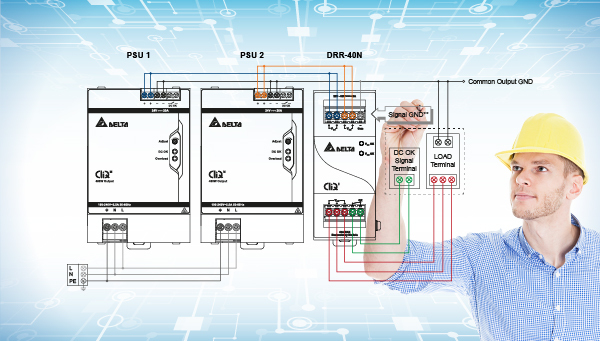 Typically, power supplies are connected in parallel to increase the power/current rating and also to increase the system reliability by providing redundancy function. Series connection of power supplies can cater to special needs of the system when requiring higher output voltages. The purpose of parallel operation is to get increased output current. When in 1+1 connection, the total output current will be maximum 2x of each individual power supply rating. Load sharing between the 2 supplies can also be achieved. (See “Load Sharing” topic below). When connecting more than one power supply (N+1), it is recommended to connect using external ORing diodes (Delta recommends the use of DRR-20N or DRR-40N). See Figure 2. To achieve redundancy function, the system current demand should not be greater than the rating of a single power supply. More details are available under the “Redundancy” topic later in this article. In the case of redundant connection, system operation is not disrupted when there is a failure in one of the power supply. This prevents overall system downtime. The power supplies can be connected together for parallel operation to increase the output current. See Figure 1 below. To achieve this, it is important that the output voltages of both power supplies must be within 25mV difference of each other. The output voltage adjustment must be done at 50% of max load current or at a load current 25% and above ensuring that both the power supplies have been adjusted at the same current level independently.